VOR is a German brand straight from my hometown Munich and long before I moved to Berlin they were part of the product range in one of the very lovely sneaker shops I was working at back then. So almost since the birth of the brand, I could watch them grow and follow their progress year after year. Since then the significant element of VOR for me always has been their interpretation of the true essence of sneakers. From their very clean approach of an all white sneaker with their signature 1A reinweiss, to their pretty sleek and still lovely bulky 3A - VOR kinda puts together all the essentials that are needed for a perfect sneaker and combines them with the best quality you can possibly think of. Because of my long history with the brand and their supper straight approach to the all white sneaker it was just a matter of time for me to finally work together again. But instead of selling their shoes in a store, like it’s been the case way back, I went to Tokyo last month with two fresh pairs of their 3A to produce a Biancissimo take of VOR aesthetics in Japan. Since Biancissmo always digs a little deeper, we - as always - added an interview to the mix to introduce you to the creative heads behind the brand and to give you more good reasons to upgrade your shoe game. 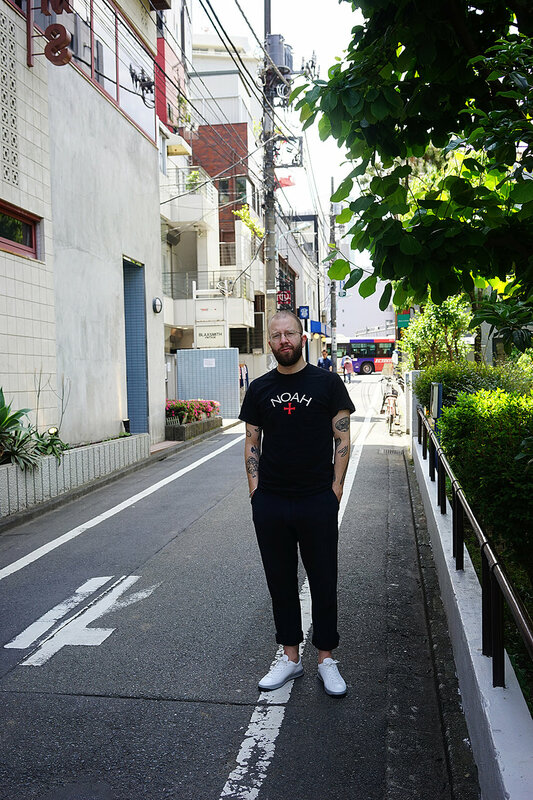 The editorial was shot during our two weeks stay in Tokyo and sums up our casual, but yet sophisticated path through the streets, bars and hot summer days of Tokyo. Hi VOR, nice to meet you and also, nice to wear you here in Tokyo! Can you please introduce yourself and the team behind the brand to Biancissimo? We are Joerg Rohwer-Kahlmann and Andreas Klingseisen. We both grew up in the suburbs of Munich and have been the closest friends ever since. From the very beginning of our adolescence we were strongly influenced by all things street so to speak. From skateboarding, basketball and rap music. We basically started VOR in 2010 with the strong drive to make Turnschuhs the way we wanted them to look. We manage all things, all processes starting from designing to distributing our shoes, ourselves. We work together with a team of shoemakers that are mutually enthusiastic about quality and overall appearance. All our products are crafted in a manufactory in the south of Germany. What is the meaning behind the name VOR and what is the idea and system behind the naming of your shoes? From the very beginning we wanted to have a German name. “Vor” as a word for us means literally being before you. Being an opinion leader in your very own sense. Being free. Free of any trends any seasonal pressure or fashion industry enforced ideals. Come as you are, dress up as you like: do YOUR thing. We wanted to have a system that could be both, sophisticated and easy to understand. So we speak in generations, we have four different ones at the moment, and declare our low cut styles as As and midcut/hightop styles as Bs. The colorways come in German labeled color codes and are occasionally fixed terms in the sneaker business. The CW 'reinweiss' is a good example. Since Joerg was designing shoes for Puma for a long time, what had to change in the designing process, comparing Puma to VOR? I guess you swapped endless feedback loops for more risk, right? The pure design process itself is quite the same. It all starts with an idea/ briefing, then sketching, drawing, creating the final design version which is followed by tech packs and all sort of development drawings. Being more precise regarding a direct comparison, yes, a lot has changed. At a big company you have many departments and different people involved. You as a designer have to listen closely, understand and hopefully interpret correctly what all departments need to achieve. No matter if it’s design, sales, development, etc. you have to manage it that they all agree at the end of the design/ development process, you have to unify not just different people, but also very different needs and reasons why they all want and need that single new product. You can imagine that this very likely doesn’t happen easily and that this is a very long road to bring a design finally into the store. A small brand like VOR has the advantage that we have no politics, no different departments, no other people at the table than us. We clearly know what we want and what we’d like to achieve with the product. We would say this would be much harder if we would be beginners and not really sure what we do. But as we work in this field since many years now we could learn a lot, collect so many experiences - this is invaluable. We definitely have to do all at our own risk, but you can compensate a lot of it if you can work on a well-developed base of experience. So what is the most exciting part about designing shoes? All of it! It certainly is one of the very motivating parts of our job which isn’t just design if you have to run your own brand. Design is just a small part of it, but one of the very satisfying. Again, you should know what you want to achieve, why are you creating a new product, what should it bring to your brand and which customers would you like to make happy with it. It might be very frustrating if you have no clear vision and start designing without a definite goal, because your result will never make you really satisfied. To be very specific, a very exciting moment in this process is when you see your design coming to life, when you see and hold the real existing product and when you see people wearing it and telling you how happy they are. That’s the moment when you know it’s worth taking the long and difficult road to success. What role does Andreas sport background play for the comfort and usability of your shoes. Is there a special wearability and mobility approach because of his experiences? No, not in a direct form as you’ve described it. We don’t want to mix fields of knowledge and we also don’t want to pretend being something which we are not if you know what we mean. Our shoes are not made to avoid overpronation or something specific like this. Topics like this should be carefully treated from people/ brands who know exactly what they do. You two seem to have an affinity and eye for colors, especially different shades of white and grey, so how long does it take you to find the right color and where do you find your inspiration for it? Ok, let's face it. 5 days out of 7 we tend to pick whites rather than any other color. For us and we think for many other people too white sneakers just feel right. They almost always match any outfit. But a brand can not only survive making white shoes. We create 'new' whites like our 'nebelweiss' but at the end 'anything goes' so any 'schöne' farbe can be seen in VOR styles. You first produced your shoes in Vietnam and then made the shift to Germany. So what were the thoughts behind that move and how difficult was it to find the right factory, price and people who are willing to pay more. There was a very good reason for that: we just haven’t been happy anymore! The quality was good, not what we have created now, but good. We had a partner who started with us although we were really small compared to their other customers such as Nike, Paul Smith and others. We could trust them and they delivered our products, which, unfortunately, isn’t always happening if you are small. But we were always at the end when it came to delivery times, capacity, things like that… and we just wanted it even better, we wanted to be closer to the production, we wanted to be able to work with our partner on a very close base also being much more influenced in the whole process of shoemaking. Exactly at this time we got the info that there is a revived manufactory in Germany, in Pirmasens to be exact, the most traditional part of Germany when it comes to shoemaking. And this has been like the ideal conception for us since the foundation of the brand yet it didn’t exist when we started. So we contacted the owner, immediately visited them and were fully convinced that we have to move there and start making shoes in Germany! It was not just perfect being a German brand producing in Germany, but we also loved the idea of very short delivery distances, speaking the same language (and thinking), the same very high requirements put to themselves like we do and so on. The part which followed then was not funny at all and we didn’t expect it to be so hard to set up the production here, recreating toolings, finding new suppliers for everything, it was a hell of a job and almost broke our neck although we weren’t beginners at all. But we made it, it just made us stronger, better and even more convinced in what we do. We talk about the price in your next question, but attracting customers who appreciate what we do and how we do it, open to pay more for a high quality product locally made was easier and much more positive when they hear your story than before. There are many people out there who want to know where their products are made, how they are made, from what they are made. And who are really happy finding a product where they not just look good with it but can also feel good wearing it. So what makes a shoe worth more than 300 Euros compared to a 140-shelf sneaker? Or better, why should people spend more money on their sneakers? The most obvious reason asking for a price like this is the quality and the materials used. We are not at all saying you have to pay more, because of exclusiveness or reason like that. But there is another reason, which is the most substantial argument; our products are Made in Germany! Producing in Germany is very cost-intensive, because of high labor costs and quality materials not always coming from a mass-production, which is increasing the price as well. Germany is one of the most cost-intensive countries to run a production. Even so, we fully believe in the local production and the high-level product we can offer to customers. In no way we would tell people what they should buy, this is done by others ;-) But you can think about if you pay 140 for a mass product made at the other side of the world where all the money in between goes. We spend more money for the craftsmen working here in Germany, for premium materials and of course for smaller productions creating less over-stock. Buy less, but better. It’s sometimes ‘simple’ as that! If you design and think about your products, do you have a special type of consumer in your head and how does he/she look like? As we said before. We want a VOR customer to be free of any constraints. Meaning anybody can wear our shoes. We ourselves do have a certain image in mind of how we want to look thats for sure. But we definitely do not want to create a whole look like right about now you wear these shoes this kind of pants and this kind of shirt. Create your own look. Maybe this is a bit 'blauäugig' and most of the people need trends to follow. if we can be a part of people's lives to create their own style-world and people feel just great we made everything right. Sneakers made their way from a teenager and subcultural phenomenon to a mainstream product that you can almost wear at any occasion and to any outfit. So would you say you can wear sneakers 365 days a year or are there still days made for a classy leather shoes? We think you could definitely wear sneakers 24/7 365 days a year. But also if the occasion sort of demands wearing dress shoes than you go for them. We personally would pick dress shoes going to a wedding. But again it all depends on how you feel and want to express yourself. Highs or Lows - you can only pick one for life. Which one you gonna take? Definitely Bs, highs for me (Andi). A hightop for me (Joerg) is 'more' shoe, design-wise a more interesting silhouette, but i`ll go for As, lows, because i wear them more often. What are your plan for the coming years VOR and where we gonna find, see and buy you? Creating more generations working on other projects that fit in our 'Schöngeistigkeit'. For now we are still focused on shoes but we do have different requests that are indeed interesting. Concerning the german market we do have strong partners for the international market we are working on partnerships for the future to come. so there will be more international traffic very soon.